This was just the beginning. The beginning of the craziness. In 2012 I had been running for 7 years and been thinking about getting into triathlons I just never knew how to do it... where do I even begin. When I moved to Sicily I met a group of crazy runners and triathletes who were perfect for me to learn. In true endurance athlete form, they took me in. 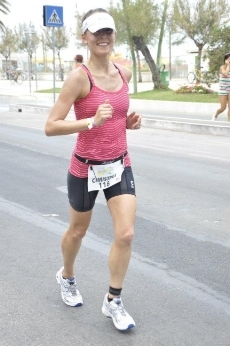 I was persuaded (didn't take much) to sign up for the half in Pescara, Italy that was occurring 2 months later. I registered online and then thought to myself, what did I just do?! I didn't know how to swim nor did I own a bike! Luckily, my new friends taught me how to swim, I was able to buy a used bike and was off to start my training. Two weeks before the race, my wetsuit came in the mail and we were headed out to do an open water swim. That was an experience. I had a melt down. Literally, a melt down. I didn't pull my wetsuit up all the way so it was pulling on my neck and it was tight. I couldn't breathe. Looking back it fit exactly how it should I just didn't know that at the time. So we get into the water (which is crystal clear on the shores off the eastern coast of Sicily) and my melt down begins. I put my face in the water only to see a swarm of jelly fish. I freak out. I stayed right behind a friend who was going super slow to stick with me but I decided not to open my eyes because I figured if I didn't see the jelly fish, they were not there. Not too logical I realize but at the time it worked for me. We made it to the other side and I survived but had major doubts about the race. I felt defeated but I was not giving up! The next week we went out again and I decided to swim on my back. It was a much better swim (mentally) for me. Come race day it was a mass start so I stayed back and was one of the last to get in. I started to swim free style and began to freak out so I flipped on my back. Much better... I spent 95% of the swim on my back doing a bad mix between survival stroke (whatever that is) and hoping a current would help push me along. I made the swim cut off with 10 minutes to spare and I was ecstatic. The nice part about coming out of the swim last is more room to get ready for the bike portion. :) I was alone on the bike course as well which was perfectly fine with me. I finished the bike and then it's off to run. I knew if I made it to the run I was good to go! This was my strongest area. I finished the race in just over 7 hours and was on top of the world. Since then I've been able to cut my times down but for my first triathlon being a 70.3, I was happy to finish!